located 7 miles from Disney. 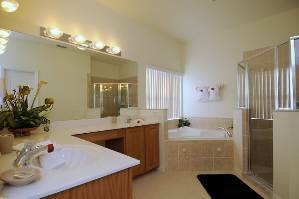 vanity units and large shower cubicle. which has access onto the pool deck. Bedroom 3 also has a PS2. nook also overlooks our pool. access to the covered lanai and pool. BBQ's are available to hire at extra cost. High Chairs and Cots are also available. Golf in Orlando Local golf courses include:- ChampionsGate offers a David Leadbeater golf academy and 2 unique 18 hole championship courses designed by accomplished architect and golfer Greg Norman. Highland Reserve Golf Club where the proof is in the putting. Southern Dunes is one of the most unique golf courses in Florida. Celebration Golf Club is the home to both the Central Florida Amateur Championships and the Florida State Junior Championships. Walt Disney World of Golf offers modern clubhouse facilities, beverage services right on the green, full service pro shops, golf instruction from PGA staff and finally 6 tour calibre courses. Orange County National has 2 courses. Panther Lake is the worlds only course with 18 signature holes whilst Crooked Cat can bring a taste of the Scottish Highlands to Orlando. It was home to the 2002/2003 PGA tour qualifiers. Hawks Landing offers a thoroughly enjoyable, elegant and energising golf experience. The Legends at Orange Lake. Are you ready to go the distance? The legends is named in reference to its founder Kemmons Wilson and its architect Arnold Palmer. Golfing in Orlando offers a wide range of challenges to any golfer, no matter how experienced. Further details on golf courses are available on request. Attractions and Shopping The villa is within 15 minutes of Walt Disney World where the theme parks include Magic Kingdom, Epcot, MGM Studios and Animal Kingdom, and the water parks are Blizzard Beach and Typhoon Lagoon. Disneys other attractions include Disneys Wild World of Sports, Disneys Boardwalk and Downtown Disney where adults can enjoy the freedom of bars and theme clubs. Other attractions in the Orlando area are:- Universal Studios theme park, Universal Islands of Adventure theme park, Universal City Walk (for nightlife), Sea World, Wet 'n' Wild, Silver Springs (natures theme park), Gatorland and Wonderworks. Attractions Nearby are Kennedy Space Center, Busch Gardens Tampa and Daytona USA. There are plenty of brand named retail shopping outlets throughout Orlando. World famous Beltz and Premier Outlets are to name but two. been delighted with our surroundings. the villa which were resolved very quickly. Would definitely look forward to another stay here! this was my second year in this villa and all I can say is it's the best!!!!! beautiful home, private quiet community very well kept, awesome pool and spa.loved every minute being there can't wait to go back,i'd like to consider it my home away from home xoxoxox thanks so much Jason !!!!!! the fencing by the pool with a toddler. The area is lovely with all amenities close by. Only a 15 minute drive to disney which was ideal. Jason is a pleasure to deal with. Homeowner Response: congratulations on getting Married in Florida. Scott and I would like to say thank you for renting with us for the second time and we look forword to you staying in our home in the future. Jason and Scott. and really nice and the spa was just lovely! This was our first time in Florida and can I say what a fantastic holiday!! The villa was perfect, it was immaculate with everything that we could possibly want and in a great location. The pool was very welcoming after a long day and we enjoyed many evenings chilled out in the Spa. The owners were great, helping us as much or as little as we wanted which allowed us to make the most of our holiday. Would defiantly recommend The Manor and already planning our return. We rented the villa this past January (2013) for the month AND are going back next January!! 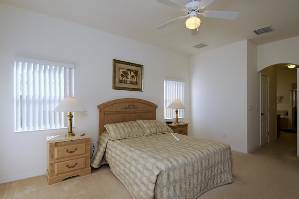 It was conveniently located near all the attractions in Orlando yet just far away to be in a peaceful environment with great privacy. It's also located in the center of Florida which makes it a great location to take day or overnight trips to other cities with great ease. It is also very close to I4 and shopping of all kinds. There was also a great feeling of security with the gated community. The house itself was perfect! Two bedroom suites plus two other bedrooms. The villa is spacious and bright and immaculate. The grounds were immaculately maintained as well. We enjoyed the heated pool and hottub--both were so welcome and relaxing especially after a long day after one of the parks. Jason and Scott have been wonderful to work with from start to finish--Very Considerate on every level. Thank you Jason and Scott for such a wonderful, relaxing experience!! We look forward to returning next January! a clean,freshness in all the linens. away from home". Highly recommend. Just returned from a fabulous holiday in sunny Florida. Villa was perfect as always, everything you could possibly need has been thought of. Thoroughly recommend the villa, perfect location. We had a very chilled out holiday using the pool and jacuzzi to the max-brilliant time had by all. we shall be going back! Just arrived back from jason/scott villa and it was spotless, being a regular villa renter we expect a certain standard and we both agreed that this villa exceeded our expectation. we always have pool heat when we rent and sometimes owners try economise by having the temperature to low but not on this occasion it was perfect, will definitly use again. We have travelled to Florida many times over the last 12 years staying in different places with differing standards. This home ranks with the best of places we have stayed at and we will be back. Its close enough to the parks and its far enough away to have a peaceful and well deserved relax on your chill out days. Its a true home from home and our boys did not want to leave. We LOVED this house and can't wait to go back. We primarily wanted a relaxing holiday, rather than theme parks, and we got it. The pool and hot tub were bliss and we loved the outdoor space - it's perfect for eating, sunbathing, reading and relaxing. The house is so spacious and has everything that you could need. Every detail has been attended to - thanks for a great place. A very attractive property which is spacious and has excellent amenities. We particularly loved the pool area and the privacy it gave us.The area is immaculately maintained and close to all amenities. We will rent again. Homeowner Response: Thanks Mr & Mrs C. Glad you enjoyed it. couldn't fault it at all. lovely and relaxing family holiday. friends, relatives and work colleagues. We had a great time staying at the Villa. All the home comforts were there and it allowed us to have a superbly relaxing time in between going to the parks. 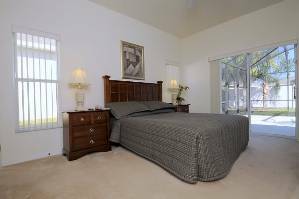 The Villa is in beautiful quiet surroundings and the furthest park in Orlando was only 20 minutes away along the Interstate 4. There were plenty of restuarants all within easy reach. The Villa is also ideally placed for the West Coast of Florida and Busch gardens. 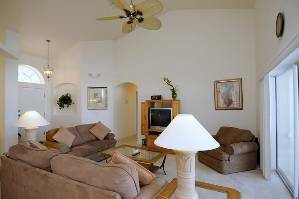 The Villa was very comfortable and spacious and we would thoroughly recommend it to anyone wishing to visit Florida. Big thumbs up. Thanks Jason & Scott - We had a great holiday - the Villa is fantastic in EVERY way. You have thought of everything, your attention to detail and customer service skills are also of the highest standard - we will be back ! Homeowner Response: Thanks Tony,your comments are very much appreciated.Jason and Scott. Our third stay at The Manor and another excellent one. It really does make a central/eastern/Disney Florida stay an easy decision and we have no hesitation in recommending the property and the location. Thanks again Jason & Scott. Thank you so much for allowing us to stay in your beautuful home. It was absolutely gorgeous, eveything we needed was there, the pool was so relaxing and lovely and refreshing in the heat. It was so conveinient for Disney, Universal and Hollywood Studios and all the water parks. We will definately book again. Thank you once again. My wife and I visited this year in May. We had one major issue. We only had a week. The house was a delight with every comfort and facility you could wish for. Not only that, the equipment and facilities within the house was of a very high quality. My wife and I have been fortunate to stay in properties all over the World, The Manor matches any of them, and superseeds most. We realy had a great time there, and will definatly return. I would throughoughly recomend anyone to spend some time there. (Not just a Week though) Regards to all Terry Jones. Homeowner Response: Thank you Terry, your comments are much appreciated. Thank you for your kind words. We just wanted to thank you for letting us stay at your lovely house and for the welcome groceries especially the Bud Lights!! The layout was perfect for 2 families with the 2 large double rooms and the pool was welcome both for an early morning swim and to relax after a busy day out! Good location with shops and restaurants quite near and v. handy for the I4 for day trips out. Alan and Rose were also really helpful and the house manual proved v. useful when looking for places to go for a change from parks. We've had a brilliant holiday - thank you again. Homeowner Response: Thanks Julie, Scott and I are really happy you had a good time please come back soon.Jason and Scott. Once again thank you for an absolutely wonderful stay in your villa. Everything exceeded expectations and we are grateful for your care and attention to detail which made this a truly memorable experience. The villa, pool, and spa were a joy -- particularly while escaping another brutal Chicago winter. We cannot say enough good things. Thank you again for everything. Jason & Scott, thank you for allowing our family to stay in your beautiful home. It was so nice to come back to a home away from home after spending a long day at the parks. Everything was close by & easy to get to. The kids loved the pool and my husband and I appreciated the hot tub at the end of the day. I can't imagine staying anywhere else besides your comfortable home when we visit Florida again. Thank you both for helping to make this one of the best family vacations we've had. We have just returned from a fantastic holiday in Florida. The icing on the cake was staying at your beautiful home.The jacuzzi was just the ticket after a day at the parks! There were 4 adults and 4 children in our party and your spacious villa offered plenty facilities for all of us.Thank you for all your invaluble help before we left answering any questions no matter how small, we would certainly reccommend you to family and friends. Hopefully we will return again to experience the magic!! Would like to say a great big thank you for the use of your wonderful villa! All of us had a fabulous time, the villa was very spacious and the pool and spa were excellent after a busy and fun packed day. It was lovely to be so close to all the attractions and the amenities within the villa and within the grounds were fabulous. Thank you again for a amazing holiday we are looking forward to the next time. Cheers Jason and Scott! 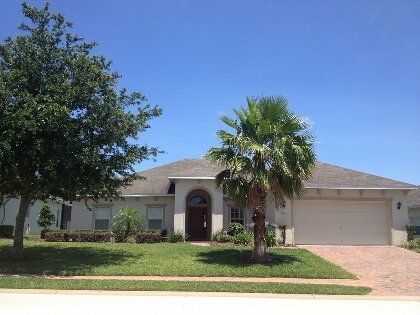 Just wanted to say a big thankyou for the use of your gorgeous Florida home. We all loved your spacious home, there was 5 adults, 3 children and a baby so plenty of room was required. Loved the pool and jacuzzi and the Wi-Fi came in very handy! Loved it..and Florida and can't wait to go back and I will..infact already have recommended it to my friends. Communication from you both was dealt with quickly and even though we really tested your patience with never ending queries you always responded politely and patiently. Homeowner Response: Cheers Nicki, glad to hear it all went well. Anything else in the future just give us a call. We came home 2 weeks ago from a great holiday in Florida. Just wanted to say how perfect the villa was for us! There were 5 adults,3 children and my 5 month old daughter and there was plenty of room for all of us. There was everything we needed and the travelcot and highchair provided were a godsend! The villa is beautiful and the pool and the surrounding area was perfect. Will certainly recommend the villa and hopefully stop there again in the future. Thankyou for all your help before we went with answering my many questions!!! Homeowner Response: Thanks Caroline, brilliant to hear it all went so well. Stay in touch. We have just returned home after a fantastic holiday in Orlando and wished to thank you for the use of your lovely villa. The villa more than lived up to the standard we were expecting, with the location and decor being first class, together with the spaciousness easily accommodating the 7 people in our party. The villa with the pool was a great place to relax and enjoy after time in the Parks. I will have no hesitation in recommending the villa to family and friends who are to visit Orlando. GREAT time. Very nice villa in a good location. Homeowner Response: Good to hear you had a great time.Jason and Scott. May 13, 2009 Reviewer: Gill & Joan From: Belchertown, MA. This has been our first opportunity to send a comment to let you know how much we enjoyed spending two months at your beautiful villa this winter. From the time we first drove into West Haven with it's well maintained landscaping and drove up the hill to the gate of the " Manors", we were impressed with the beauty of the area. We appreciate your close contact with us to ensure we had a good time, as well as the assistance of FHI Management during our stay. We hope to return in 2010. Homeowner Response: Thank you Gill & Joan, hope to see you in 2010. I just wanted to let you know that we had a fantastic time on our trip to Orlando. Your home exceeded our expectations, and we are very happy to have had the opportunity to stay there. We hope to go back to Florida again, and we will definitely keep your house our first choice. We have already passed your name on to other people. Thank you very much. Hagfors & Abel family. everything that we needed. We will definitaly be recommending it to our friends. Well Frankie and his gang have now been to Florida to celebrate Frankies 60th birthday. " What a party "
The whole trip was a Magic experience.
" WE'LL BE BACK "
What can i say that has not already been said, this was our first holiday to America the experience was well beyond all our expectations. The villa is all anyone could wish for to make their holiday great, loads of space for our party of 5 adults and 2 children and also it is superbly fitted out with everything you might need. The welcome pack was a bonus after all the hours travelling(thanks). The pool and spa are great for chilling out after long days at the disney parks. My son has already booked the villa for next year and is counting down the weeks till his return. I would highly recommend this villa to anyone. Lastly I would like to thank Jason for all the help and advise he gave me booking flights, car hire and disney tickets. Homeowner Response: Thanks Les for your kind comments, it was our pleasure to help.Jason and Scott. We have been home from Florida for nearly four weeks. The sun tan might have faded but certainly not our holiday memories! The villa was everything we hoped for and alot more. It was easy to find and its location was ideal for the parks and the Gulf Coast. We would certainly recommend the property to any future holiday makers. Many thanks to you Jason and Scott. Homeowner Response: Many thanks. Jason and Scott. Homeowner Response: Thank you David and Jan. I don't know where to begin....the house was wonderful, everything was so nice, the furnishings were excellent. I took lots of pictures of the house to show everyone...they could not believe how wonderful it was and the amazing price! The communication with Scott and Jason was exceptional, they were always available when I needed them or had a question - they go above and beyond! Anyone looking for a great vacation rental, would be crazy to pass this place up! Thanks for everything - we had a great time....I hated to leave the house and that wonderful pool! Homeowner Response: Thank you for your wonderful comments,please come back again.Jason and Scott. Homeowner Response: Thank you Mark. The villa was absolutely superb and far exceeded our expectations. There were six adults in our group but we never felt like we were on top of one another due to the spacious layout of the property. All of the rooms were a good size, especially the en suites in the two double bedrooms. The pool area was a lovely place to catch the sun, relax and eat our meals. The location was also ideal in that it was far enough away from the hustle and bustle of downtown and tourist areas yet it in no way felt remote. All of the main attractions and Orlando airport are within a very short drive and are easy to find off the main Interstate 4. On top of that, every local amenity you could need ie supermarket, pharmacy etc were just a couple of minutes away. All in all it was an excellent base from which to explore and enjoy the sights and sounds of Orlando and indeed the rest of Florida. I would thoroughly recommend it. Homeowner Response: Thanks very much Lucinda, don't forget to check our calendar next time you want to go to Orlando. all linens and left trash in the garage trash can.We really enjoyed staying in your villa and hope to return sometime. Homeowner Response: Thanks very much Monica. It's great to know that our house is so ideal. Well, we are back from our stay in Florida at your home and want to say thank you! We arrived at 3:00 pm Sat after a lengthy drive through lots of snow and found the house ready and waiting and with the pool ready to go. Thanks for your effort to have the house ready. We found our accommodations to be exactly as expected and enjoyed a great stay. This is our second year in the neighbourhood and we really enjoy the space and quiet these homes offer. Again, thanks, and we hope to book with your next year! Homeowner Response: Thanks very much for your kind words and keep in touch. Homeowner Response: Thank you for your kind words.Jason and Scott. Myself and my family have just returned from our holiday in Orlando, staying in this beautiful villa near Davenport. The villa was very spacious and had every amenity we needed to ensure a comfortable stay. Having stayed in seven different villas in this area we were agreed that this one has been the best so far in terms of condition, cleanliness and attentive service by both the villa owners Jason and Scott and the management team at FHI who were very helpful and friendly. We chose this villa as it was on one level because of the worry about my 3 year old and flights of stairs and the layout is very good,with the main suite being away from the other bedrooms for privacy , although as there were only three of us we used this as a getting ready to go out room which kept clutter from the sleeping rooms. we only encountered one problem during our stay in that the waste disposal wasn't working, but one call to the management office had it fixed the same day while we were out at the parks. Outside the gardens were tidy and well kept (every blade of grass on the estate is the same length!) and very private at the back where the pool area is. We paid for the pool to be heated for the duration and it was well worth it as the water was as warm as a bath some days especially the spa ( I have noted sometimes that heated pools barely heat the water above the air temperature but this one was great). Overall our stay was well worth the cost, especially as the villa is so reasonable and the best value I have booked in this area, you may find one a little cheaper but I guarantee it will not meet this one for standard and value for money. We will be booking this villa again in the future and hope you find the villa as wonderful as we did should you choose to stay, which I'm sure you will. Wow! The accommodation was wonderful. I have been to Florida 3 times before but nothing has compared to your fantastic villa. but quiet enough if you like a relaxing holiday. Evie and thank you for providing the extra bed for Alex. Even with our big group we found that there was plenty of room for us. The pool was great to come back to after a hectic day at the theme parks. (Chilis was great for Mexican food). All in all, your home provided a major part in us having a super holiday. Thank you so much, and also thanks for the welcome pack. We will be spreading the word for you and hopefully will return in the near future. Homeowner Response: Thank you for your kind comments.Jason and Scott. We had a great vacation - the house was wonderful! We particularly enjoyed the welcome package. We would like to stay there again, and will definately keep you in mind for our next vacation. Just a quick e-mail to say thanks for such a great holiday and for taking the time to check everything was just right for us. The villa is superb – well placed, well stocked and tastefully furnished. We could not have asked for more – a real home from home that I will certainly recommend to friends. When we are next planning Orlando we’ll give you a call and book again. Our vacation was wonderful. The house was beautiful and better than expected. My son loved the pool, he had a better time in the pool than at Disneyworld. The management company asked if we had everything we needed. We would definitely stay there again. The week came and went quickly. Thanks for allowing us to stay in your home. We thoroughly enjoyed our stay in your lovely home in Florida. The house was clean and well equipped, a real home from home. The location is excellent, not too far from the attractions, but in a lovely quiet area, perfect for relaxation away from it all. Local amenities are very convenient, it was so handy to have shops and restaurants nearby. We would have no hesitation in recommending this holiday property to anyone wishing to spend time in Florida! "We rented in August 2006 for ten days. What a fabulous place! Large spacious living area and bedrooms, with luxury bathrooms and the convenience of a pool and terrace area outside the lounge door. 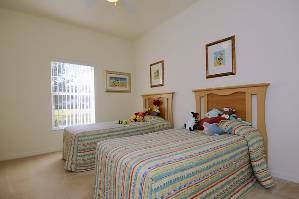 The air-conditioned accommodation provides occasional welcome relief from Florida's hottest days whilst the location is excellent - only 15 minutes' drive to the nearest Disney parks, being on the south west side of Orlando. The location is easily found whether flying into one of Orlando's two airports or Tampa (as we did) an hour to the west. Our holiday was memorable, and a big part of that was having quality accommodation." We just wanted to tell you what a fantastic time we had at your home in Florida, lovely spacious rooms, fantastic pool and safe environment, everything we needed for six of us, local shops, close to all the theme parks 10 mins stress free driving what more could we ask for, The staff at Florida homes international were very friendly and the house clean and welcoming, they were always available with help and advice where to shop etc, A lovely home in a great location and very very good rental rate for such an amazing property. We cant wait to book again!!! We have visited Orlando 6 times. 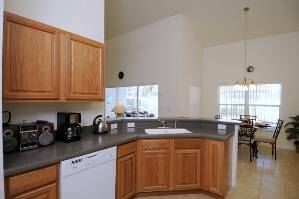 On previous occasions we have always stayed in the Disney Resort area, but on this occasion we decided to rent an executive house in West Haven, Davenport. We arrived at the house early evening wondering if we would enjoy the experience of staying off the Disney site. After staying at the house a short while we realised we had made the right decision. Situated just 15 minutes from the main Disney area it was an ideal base for visiting all the main attractions (Disney theme parks, Universal Studios, Sea World and many more). The house itself was simply outstanding. Four large bedrooms, superb lounge, wonderful kitchen/dining area and an inviting large private pool with spa. It had every home comfort you could ask for. Situated in a quiet gated area, it was lovely to come back and relax after an exhausting day at the theme parks. Just minutes away were a wide range of restaurants and a large supermarket for stocking that large American refrigerator. We would highly recommend The Manor at West Haven. We could not wish for a better base for discovering all Orlando has to offer. It was our best Orlando holiday to date and we hope to return soon. Paul, Anna and Jamie Hughes. Homeowner Response: Paul has since booked again and his new comments are below.After a great holiday in August ’06, we decided to return to Florida July’07.We stayed at The Manor, West Haven once again. 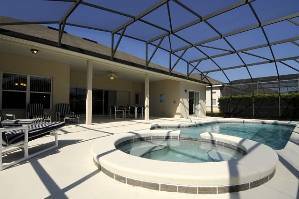 Superb accommodation, wonderful private pool and an ideal location for Orlando attractions. Can’t wait to book again!Paul, Anna and Jamie Hughes. Before this winter tan begins to fade, I felt I must drop you a line to thank you for allowing us to rent your wonderful villa in Orlando, Florida. My mother, our son and daughter and their partners, and the two of us all enjoyed a marvellous Christmas and New Year, with frequent visits to the Disney parks. The location of the villa, just off the I-4 at Champions Gate, was so convenient for the parks, with the journey to Disney taking little more than 15 minutes. On New Years Eve, we decided to chill around the pool until just before midnight, then we walked to the gated entrance of the estate and watched the fireworks display in the distance as we sipped champagne. Magic! Everybody in the party loved your villa. The kitchen had everything we needed and we were grateful for the Welcome Pack that your agent left for our arrival. Everything was spotless including the pool and pool area where we spent a lot of our time relaxing. The bedrooms easily accommodated the seven adults in our party, and the Master Bedroom was superb! Deposit: DEPOSIT: To confirm the booking, a deposit of 25% of the full rental cost for the period must be enclosed with the completed and signed booking form. Upon clearance of the cheque, the booking is confirmed. You must check the confirmation and final invoice carefully and raise any queries immediately. Cancellations and Refunds: CANCELLATION: In the event that you cancel your booking for any reason whatsoever, the following charges will apply: ..Period Prior To Departure & Cancellation Fee Charged : 10 weeks prior = Deposit only...4 - 9 weeks prior = 50% of full rental cost...Within 4 weeks of departure = 100% of rental cost.... ALTERATIONS TO BOOKINGS: If, after your booking has been accepted, you wish to alter your arrangements, we will do all we can to help but an administration fee of up to $50 per booking may be charged. Other Fees: Pool heating available at $125.00 per week. Spa heat only at $63 per week. A cleaning cost will apply for stays less than 5 nights.